The 6th Fuller Future Festival will feature hundreds of artifacts on display from the Museum Of Livingry the entire month of August 2017 in the Varsity Center in Carbondale, Illinois. Join us on Tuesday, July 12th at Cristaudo’s in Carbondale, Illinois, in celebration of Bucky’s 121st birthday. 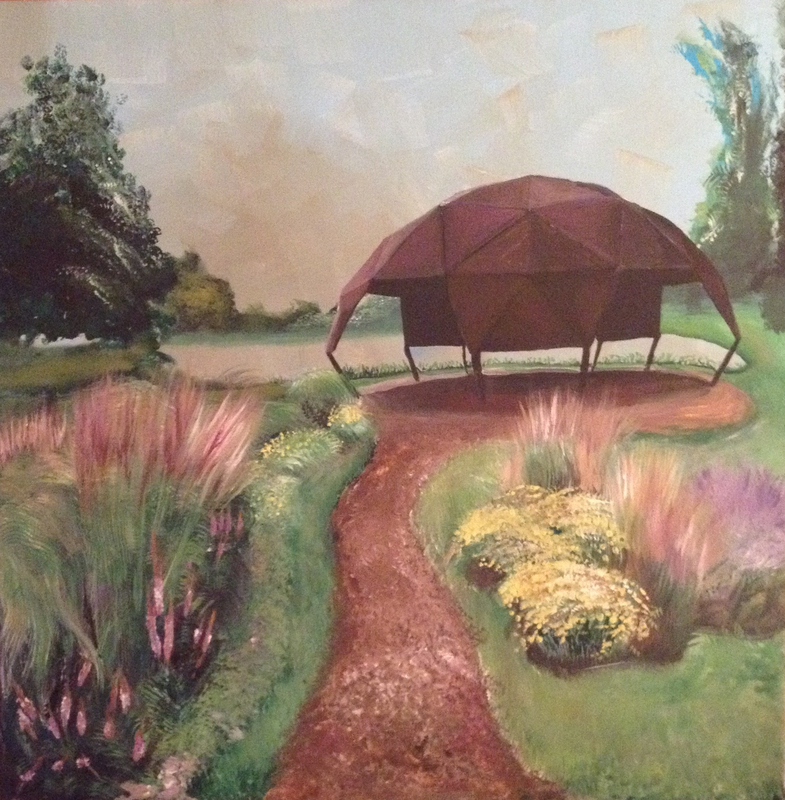 The Geodesic Dome is up and waiting to be dedicated as the newest feature of our renamed LabyrinthPeace Park. We have erected an open, sculpture-like dome that stands over the labyrinth. We believe that ours is the only labyrinth in the world covered by such a dome. This particular labyrinth layout is similar to the Chartres Cathedral labyrinth, but uniquely modified to reflect Buckminster Fuller’s geodesic “Synergy” dome geometry. At noon, on Thursday, April 23, you are cordially invited to a lunch celebration under the dome at the Labyrinth Peace Park. It is located just north of Gaia House, 913 S. Illinois Ave. in Carbondale. We like to think of this location as the intersection of the University and the City. Following a brief renaming, dedication, and ribbon cutting ceremony, we will serve LabyrinthLunchibles, Dome Scones, and Bucky Brews, named after R. Buckminster Fuller whose residential prototype dome originally stood at this site. You are invited to come early at 11:30 am, if you wish, to experience walking the labyrinth under the dome. We would appreciate you signing the Labyrinth Walkers Book and telling us what your experience was like. And please note that you are welcome to do this at any time. The Labyrinth Peace Park is always open. This event is associated with the Fuller Future Festival, Exploring the Sacred Geometry of Nature, being held in Carbondale, March 1 to April 30. We appreciate your interest in, and support for, the ongoing enhancement of the Labyrinth Peace Park. Our hope is that it will become a well recognized and well visited component of a redeveloped downtown Carbondale.